Are You Ready to FINALIZE? I noticed this message the other day when making a DVD copy of one of our services. I was attempting to "finalize" it. 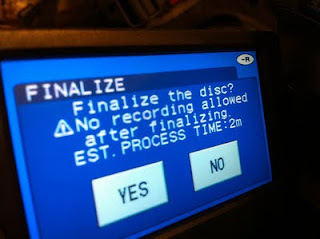 That is the last step in the process of having a DVD that is useable. There are a couple of things I learn from the process that can apply to life too. Though I recorded the service, if I do not finalize the disc, everything that went on it is for nothing. You can look at the back of the disc and see clearly that something is on it but you cannot enjoy it until it is finalized. The other lesson for me comes in this warning: "no recording allowed after finalizing". Once I have done this to the disc, I cannot re-record over it. You and I have some events and circumstances in our lives that are in desperate need of "finalizing". Every difficulty and challenge you have endured or are enduring has a purpose for you to grow through. I don't like the word "closure" because all of those dark seasons seem to "hang" around and be available if you want to see them again in your mind. Finalizing the season completes the chapter, seals the recording and logs it into the past. And when its finalized you don't go back and do it again! No re-recording once it has finalized! You get a brand new disc and start a wonderful new season! So are you ready to "finalize"? There are only two choices. It's all up to you. ......"finalizing cup of joe for today"......done!